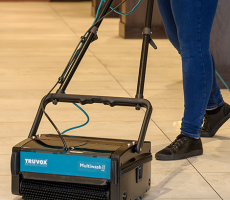 The Sandwell and West Birmingham Hospitals NHS Trust has just purchased a total of eight Truvox battery scrubber dryers to assist in improving cleaning standards at Sandwell Hospital and Birmingham City Hospital. 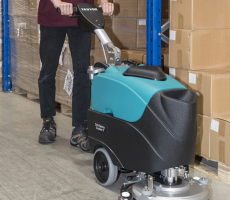 Bought through Truvox distributor The Clean Machine Direct Limited in Telford, the compact and highly manoeuvrable battery-powered scrubber dryers have made cleaning both easier and more efficient, particularly in the maternity unit at Birmingham City Hospital. Senior Hotel Services Officer Karen Godwin confirmed that, although the hospitals already had scrubber dryers, they were much larger and had trailing cables. The new battery-powered machines have no trailing cables and are therefore more easily manoeuvrable.